BL520 R-XW chain Received ordered chain for my CRF250M in good condition. Looks rare in black and gold color. Can't wait to install it on my bike together with my new sprockets. Ideal for CBR 250 RR! MC 51 was at 112 Ring's 520, with Crimp attached, there was absolutely nothing to buy. Anxious Friction can multiply Motorcycle to MaintenanceSTAND and turn Wheel, anyone can be touched by the difference! Since we doubled as Circuit driving and public roads, I was worried about Non-seal, but I am satisfied with the result in GC520 MRU! I think it's good. Although engine oil is circulated in the primary case, Clutch is a solution against contradiction of dry type. It seems there is not Maintenance-free so it may be for people who usually mess with a single car. Well everyone will do as much as Shovel. Red Pad is over so try Exchange from Red Pad, Touch feels close to OEM. Compared to Red Pad, there are no guts, but it feels like it works. There is no problem like this even with Hard Breaking, it works well. After that, if Life is long, I will also buy the same thing next. Along with Front, Rear also replaces Purchased Rear because I liked Front's Touch and effect. Like Front, it will work comfortably. If even Life is good, we will also make the next exchange the same. It is necessary performance enough. It will be used with ADDRESS V 125 G.
I use it almost for the movement of the city center, but it is necessary and sufficient performance. Since there are super-discount items of Chinese products now, COSPA will lose to that, but is not it that this price is a proper Manufacturer item. Life is in use so I can not say at the moment so I am doing it in the middle. Cost performance ◎ I purchased it because I needed a new Chain when swinging Arm. Lightweight Sports type motorbikeExclusive Design seems to realize contradictory requirement for public road and for Race at the same time. After installing Rear wheel by hand, it turns to Smooth more than when OEMChain and feels like the car body moves lightly even when walking around. Cost performance is good and OEM same etc. It seems to be durable so I thought it was perfect for 250Sports type motorbike. 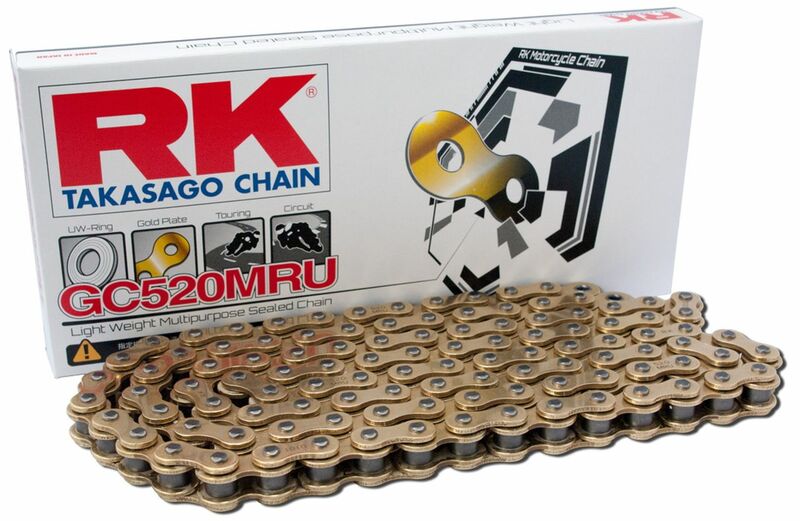 Chain changed from 525 Size of RK OEM to 520. From the moment I got on the change I was able to experience the change. Acceleration is better than OEM. Although it seems that durability is declining, there is Neck, but Chain color also seems to have many such as Gold and Black, so if you buy next time you are satisfied enough to try it as RK.